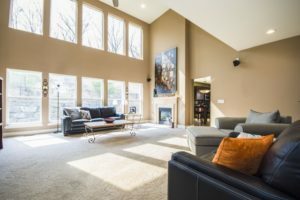 Whether you are planning to remodel your home or add a touch of elegance to your space, you might be surprised at how carpets or rugs can change the décor and ambiance. It can be a daunting task to choose the right materials and textures which work best for your needs and fit well with the existing settings. Many homeowners choose wool, seagrass, jute carpets and sisal carpets. Keep reading to find out the most popular types of carpets and rugs to make it easier for you. A sisal carpet can add a welcoming and warm neutral accent to your home. As the most durable and strongest natural fiber, this material is non-toxic and has eye-catching braid or weave highlights, which can create texture and depth. A sisal rug could be great for a hallway or entryway where there is a lot of foot traffic. Completely biodegradable and sustainable, this is an excellent eco-friendly option. The only drawback of sisal carpets is that they might get stained easily and can feel a little bit coarse underfoot. Also, you should not use them in a wet area such as the bathroom or kitchen. Jute is another natural material which exhibits effortless elegance. It is available in several color options such as golden brown, tan, or beige, which can be paired well with any scheme and showcase its appealing woven patterns. Relatively maintenance-free, jute carpets can be a great option for a family with children and pets. All you need to do is vacuuming once a week to get rid of dirt, dust, and debris. Also, avoid cleaning the surface with water to prevent mold from growing. Cultivated in water, seagrass is a nonporous material that can resist stains and won’t attract dirt or dust. Spilled a bit of coffee, food, or wine? Not a problem. You can easily use a damp cloth to clean the affected area. Thus, seagrass carpets or rugs can be the perfect choice for kitchens and bathrooms. The color options, however, can be limited with this material because the fibers are often available in green hues and might fade over time to a beige color. Similar to jute and sisal, seagrass is also eco-friendly and affordable, making it a great option for those who are looking for a long-lasting and durable solution. Wool is undoubtedly one of the popular options for carpeting as it is a great combination of comfort and durability. A wool carpet or rug can be used in different spaces in your home, such as the living room, family room, or dining room. With resilient fibers, this material can last long in high traffic areas, but its softness makes it luxurious and comfortable as well. Available in a variety of patterns and colors, wool fabrics are a perfect way to bring different spaces together. Keep in mind to place your wool carpet in an area without direct sunlight exposure, or it might fade quickly. Another disadvantage would be the higher prices compared to other natural or synthetic materials. The different types of carpets and rugs can make a difference in your home. Some carpets can handle a lot of foot traffic, while others can not. Be sure to pick the right type that will best fit your needs. Remember, the most popular styles are wool, seagrass, jute carpets and sisal carpets. All Rights Reserved by Clean Customs. Powered by WordPress and Legal.